Cognitive Dissidence: Nation Consulting Public Relations Experts? Much has been written about Nation Consulting's stranglehold on the Democratic Party. While the Democratic Party insiders hold them up as some kind of experts, we found out that their owner, Thad Nation, not only helped push the horrendous Enrbidge pipeline through our backyards(not his but ours). Mr. Nation, also has ties to right wing extremist groups Americans for Prosperity and Freedomworks. We all know that Americans for Prosperity has nothing but the Democrats best interest at heart! But as loyal readers know, there is more. There is always more! Jeff Blumb brings a quarter century of high-level public relations and strategic communications experience to Nation Consulting, joining our team after more than two decades in the public relations efforts for the Green Bay Packers and prior to that, serving on the Miami Dolphins public relations team. As director of public relations for the Green Bay Packers, he was responsible for media relations, team services and the team publications and web sites, as well as providing PR counsel to the team’s coaches, players and top executives. He was also responsible for the cohesiveness of the Packers’ organizational messages and PR strategies. He was also chosen six times by the NFL to work the Super Bowl as a select group of invited club PR staffers. His tenure with the team has honed Blumb’s skills in working with the media, in crisis and event management, messaging and brand enhancement. Blumb has an extensive network of media contacts with print, electronic and broadcast media, and understands how to leverage those relationships in working with a variety of clients. Now lets take a look at Mr. Blumbs messaging prowess in action. I suppose the upside to the Eddie Vanderdoes injury is that he will have more time to spend with his sick grandmother. For the non sports fans among us, Eddie Vanderdoes is a college football player who plays for UCLA Bruins. He blew his knee and missed the year last season and Mr. Blumb tweeted this out approximately the time he was injured. Mr. Blumb made a good impression on twitter, especially with someone who appears to be related to Mr. Vanderdoes. @jeffblumb I hope you feel good about yourself. @jeffblumb something wrong with u man! u need help and I hope u find it! @jeffblumb So bitter about a kid not picking your school you mock his injury & insult him? Karma is a mother fucker. @jeffblumb you're an ugly looking dude. Did anyone ever tell you that? @jeffblumb what a classy professional old man..
Mr. Blumb took a beating and did what you would expect a good PR person to do, hide and not own up to your mistake. While this gets a little bit in the weeds, the larger point here is, if this is your PR expert and this is how he handles messaging, is there any surprise why the Dems went from being in control to being irrelevat in a matter of three elections? Is this the kind of messaging that helps win elections? I would highly recommend asking if a candidate has hired anyone from Nation Consulting to work on their campaign, before you think of handing them any money! Why throw good money after bad? It isn't just Wisconsin. The coronation of Hillary Clinton, a neocon war monger that accepted more than $600,000 to shill for corrupt bankster is more proof. The problem is the Democratic Party and what we see in Wisconsin may seem like extreme incompetence, but it is actually what the national party stands for too. 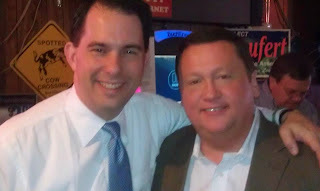 In Wisconsin, they have decided there is no need to run "Republican Lites", because Scott Walker and his cronies are capable of enacting essentially the same agenda themselves (OK, perhaps not on labor issues, but on everything else). Tate and Nation, in their own eyes, have "accomplished" exactly what they wanted to do -- turn the party into a punching bag and then use their ineffectiveness as justification for raising money. Cuz, ya know, if we just gave them more money, that would fix everything -- right? You can make a LOT of money losing elections. @CJ Is that not the plot of the Producers, except in the Producer's case they accidentally produce a success.